Pioneer Institute of Professional Studies is organizing 22nd National Conference on Youth: "Grey Matter of the Nation" on 15th October 2016. Original Research Papers (both Empirical and Conceptual) are invited from Academicians, Industry Practitioners, Research Scholars and Students on the sub-themes given in the brochure. The committee of experts will review all the submitted papers. Registration fee should be sent along with registration form. The registration fee covers breakfast, lunch, evening tea, kit & certificate. Registration fee is non-refundable. However, change in nomination/s is acceptable. 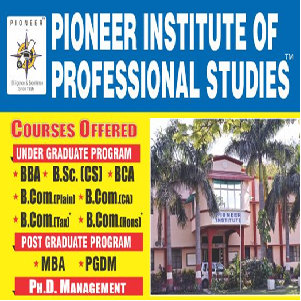 Registration fee can be paid through DD/ Cheque in favour of “Pioneer Institute of Professional Studies” payable at Indore.For the hardcopy of the ISSN Journal, extra amount will be charged. For details please download the brochure.